Play dates are one of the things that keep us mommies sane. For me it's play dates and gym time that provide my mommy sanity in the summer time. One gives me time with my kids having fun but mom conversation as well and the other gives me time alone or with gym friends. While we had quite the mild spring, it has seriously heated up around here and having fun outside is either short or must involve water! 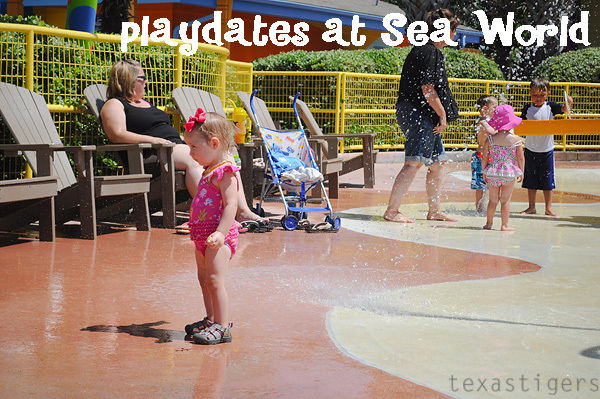 For that reason, Sea World is one of our favorite places to have a play date with friends. While Abby was having her last day of school, the little two and I met our friends for a day of play. 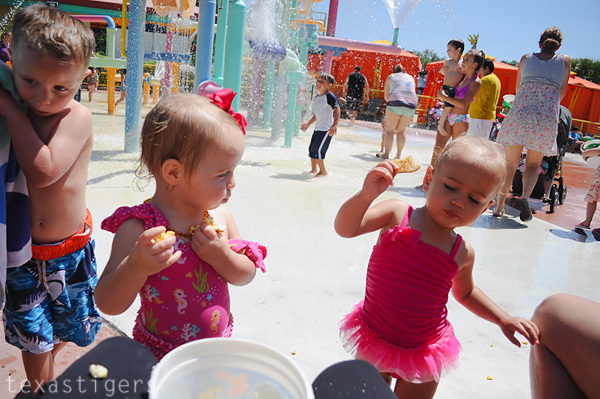 We started with some water play and because our littles are so similar I think their favorite thing about a play date or a Sea World day is the snacks! We brought in our allowed single serving snacks as well as filling up our beloved popcorn bucket. With our little girls it's totally all about the snacks more than about the play! This guy played hard! That doesn't mean he's going to miss out on the snacks either though! 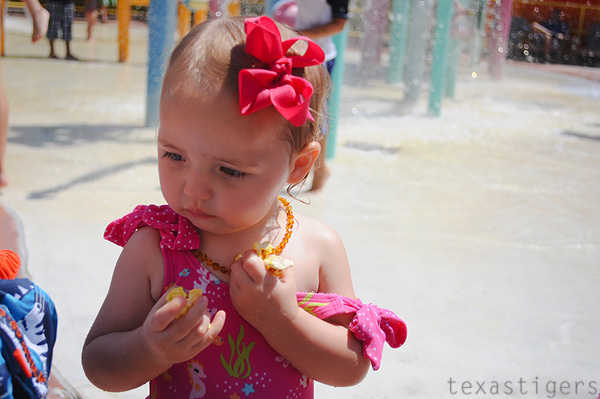 I loved having a friend in the water park section because it meant we had an extra set of eyes on our kids. I love how big the splash pad area is but also dislike it because it only takes a split second for a kid to dart off and you miss where they went. It gave us a little less anxiety to have that extra set of eyes if we lost track of where one of the preschoolers were playing at the moment. 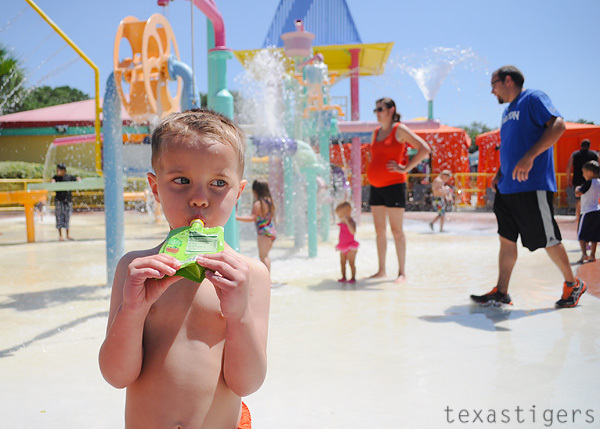 Once we were decently cool from the water play, it was time to dry off and enjoy some of the fun rides the Bay of Play has to offer. 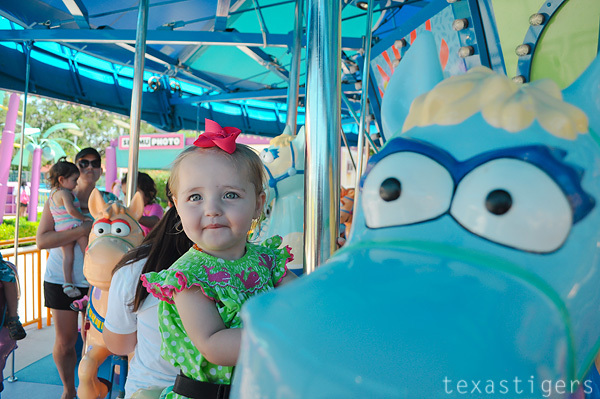 The carousel is always a hit! Micah finally hit the height requirement at the end of last year to be able to ride the Shamu roller coaster. Having another mommy friend with us meant we could take turns taking the preschoolers on rides that the littles are too small to go on. That's something I can't do when I take the kids by myself. Plus being with other mommies means we go at our speed and not Daddy speed (who sometimes tend to get ready to move on before the kids are!) Micah was so--- excited for the roller coaster and loved it! He's going to be my little daredevil roller coaster rider when he gets bigger. I'm sure Beau will be thrilled once he can finally ride the big rides with Daddy! We also did a couple of the other rides before calling it a morning. We headed out and all the little guys were out before we left the parking lot! They even played hard enough that they transferred into beds for nap time at home with no issues! That's a win in my book! 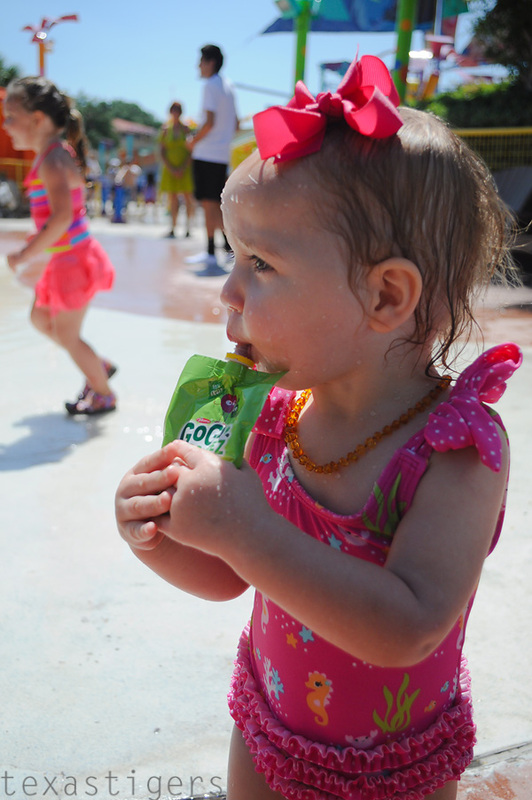 With toddlers in tow for a successful play date or just visit to Sea World in general, my key things to remember are keep snacks readily available, spend plenty of time doing things they can participate in (the Bay of Play is perfect for that!) and know when they are close to their limit so you can head for home before that worn out fit happens. If you hadn't heard Google reader (and therefore Google Friend Connect) are going away soon so if you want to keep using a reader to follow your favorite blogs you'll want to switch them over soon! Bloglovin' made it easy to import all my Google reader blogs and I'd love it if you want to hop over and follow me over there! 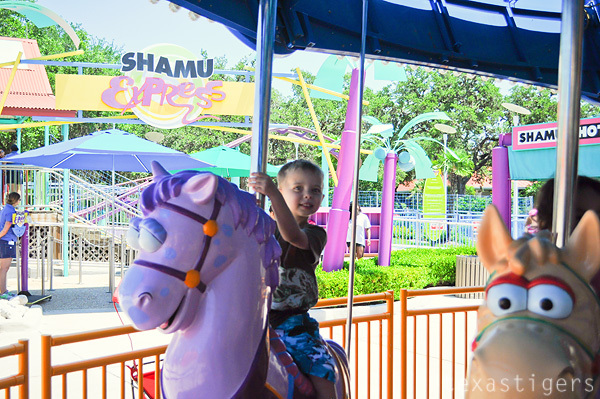 As you know, we're big fans of SeaWorld but we love SeaWorld playdates too! Our friends just bought passes and we can't wait to take our kids there together many times this summer.